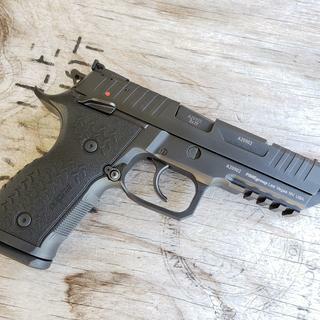 Rex Alpha 9 is a single and double action, semi-automatic handgun with a black finish. 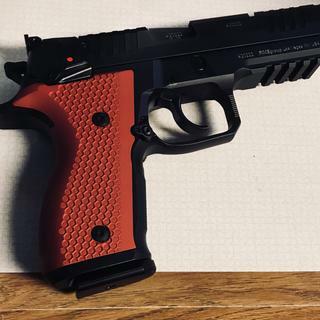 The Rex Alpha 9 has a 17 rd. capacity, red fiber optic front sight and fully adjustable black rear sight, and an extended beavertail. Grabagun has the best prices. I have the Arex 01S and its excellent quality. 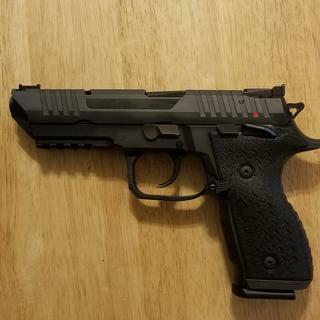 This pistol is the same quality level of other competition steel gun but just under $1000, not 1200 to 2000. Its looks totally BAMF. I own the rex zero 1S and I ABSOLUTELY love it. Quality company. So when I heard about the Alpha I had to have it. Full steel target grade 9mm under $1K...nuff said. The Rex Alpha 9 was picked as one of the best new guns at Shot Show 2018. 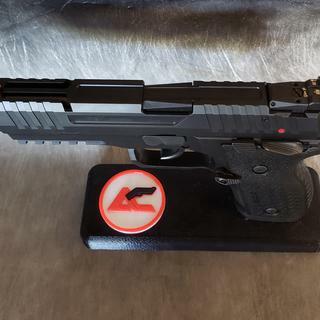 And I’ve owned the Arex Rex Zero 1. Can’t wait to get my hands on this competition model. Truly exceptional single action, ignore the DA as mine breaks off the scale. Pistol is well finished and more accurate than I can hope to be. Highly recommended. Grabagun shipped this within a day, couldn't ask for better service. Hopefully when CZ finally releases the new Bren we can do business again. I love this new Rex Alpha! Right out of the box it out-performed my Beretta 92 with comfort & accuracy. The sights are easy to lock on from recoil. I highly recommend it! 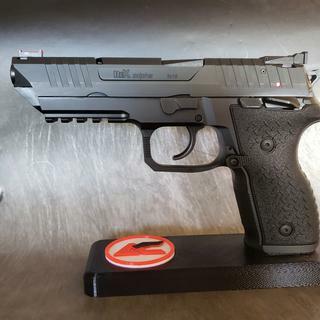 FANTASTIC pistol and while th emost expensive from the REX line, it is 'well worth it"
If Darth Vader lost his light saber, he'd use this as a blaster. All steel construction it looks like a 1911 and a Beretta 92 had a baby. Comes with three hammer springs swappable by the user. Light spring gives about an 8lb DA pull and a 2lb SA pull with short reset. Smooth slide action. 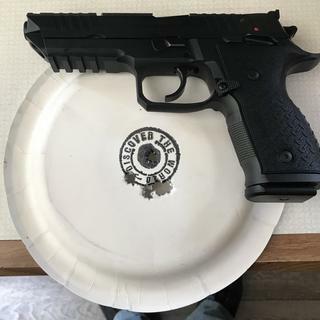 This is one accurate handgun right out of the box! It feels right in the hand and shoots straight. No problem feeding either. My favorite handgun by far. Trigger is perfect. Sights easily picked up. Very low mussel flip so you get back on target super quick. 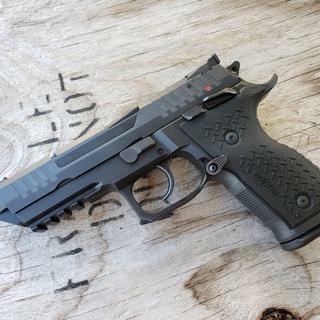 The Rex Alpha is a very nice, and high quality pistol built to compete with the best. The trigger nearly perfect out of the box for single action with a fast reset. Adjustable sights are excellent and competition grade. I don't think it needs any additional tuning at all. It his great looking and the fit and finish is excellent. Definitely in the same class with the CZ Shadow 2. It is a keeper for sure! 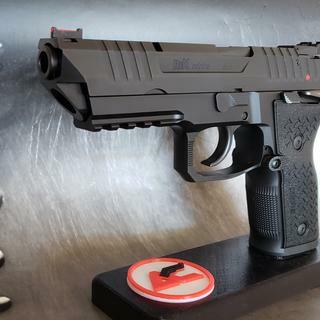 The Rex Alpha is a great pistol, which leans heavily toward competition. The trigger is pretty good in double action and outstanding in single action with a fast reset. Adjustable sights are excellent and competition grade. Overall style gets it noticed, and sets it apart. Three high quality magazines are provided with the pistol. Overall fit and finish is excellent. Compares with the CZ Shadow 2. This is an awesome pistol, I love the single action trigger, wonderful sights,if you are a collector it’s worth having.